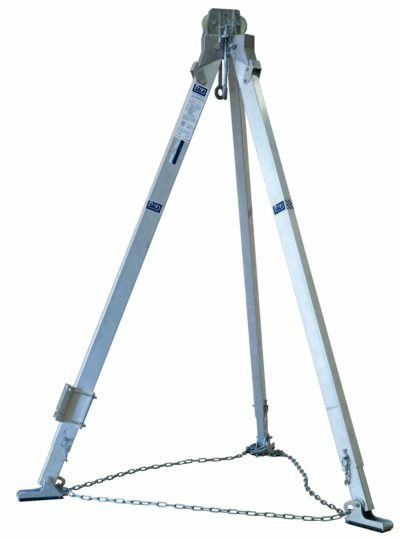 This aluminium tripod is lightweight and portable, easily set-up by one worker and can be transported from one location to another just as easy. Adjustable locking legs adjust quickly in increments of 2-3/4” for added versatility and are kept in position with locking push pins - adjusts from 5 ft. to 9 ft. height and will span a 5 ft. diameter hole. Complete with safety chain to prevent movement and safety shoes that incorporate a rubber sole for flat surfaces and spiked edges for slippery surfaces. Heat treated cast aluminum head incorporates a built-in pulley system to rout lifeline of mechanical device directly over opening. Also equipped with drop forged steel eyebolts for use as anchorage point for secondary or back-up system, designed to allow the eyebolt to hand plumb regardless of surface configuration.